Adobe still intends to launch the latest version of its Flash Player for smart phones in the first half of the year. Adobe Systems Inc. was planning to demonstrate Flash 10.1 at the Mobile World Congress trade show in Barcelona, Spain, this week. Flash is used to play Web videos and games. Mobile systems that will work with the full Flash Player include the BlackBerry, Google's Android, Palm's WebOS, Windows Mobile and Symbian, used on Nokia's smart phones. The San Jose, Calif. company says Flash 10.1 will also work on many tablet-style computers. But Apple's iPad and iPhone are still off the list. 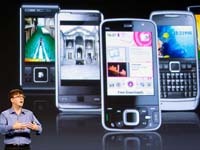 Adobe also plans to unveil its AIR software for mobile devices. It builds Internet applications that can be opened without a Web browser. Associated Press news agency has contributed to the report.